Broad-leaved paperbark, or niaouli, is a medium-sized, fast-growing tree native to Papua New Guinea, New Caledonia and the eastern coast of Australia–from Botany Bay to Queensland and the Northern Territory. Paperbarks have also spread to the Everglades of Florida, where it is deemed a pest. It’s bark is layered and peeling, much like a birch tree, and has a paper-quality to it, hence its name. 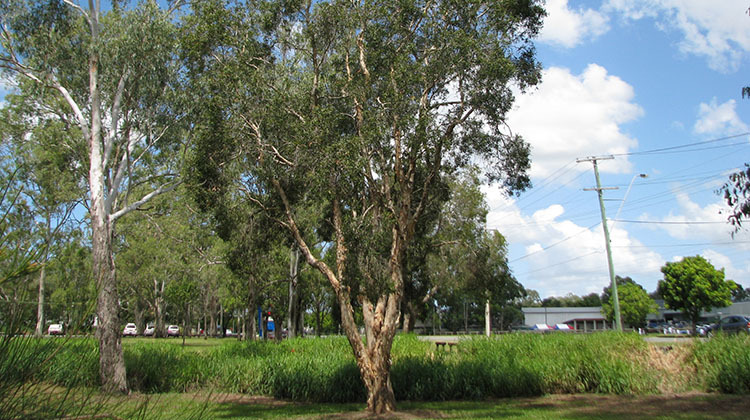 Paperbark grows up to 8 to 10 metres high with a canopy 5 to 10m wide. The leaves are leathery and either dull or gray-green in color. The bark is beige, white, or gray and looks like thickly-layered paper. Note the codominant leaders with the inclusion of bark between them. This is a common fault with paperbarks and can often lead to failure. In valuable trees cabling or bracing may be necessary. Bark should not be allowed to accumulate in the join to avoid rot. Broad-leaved paperbarks flower from the beginning from spring to early autumn: September to March in Australia. The white or cream flowers are arranged in cylindrical brushes some 4-8cm long and 2-3cm wide at or near the end of the branches. Paperbark leaves are arranged alternately, dull green or gray-green in color, and leathery in appearance. The leaves are 5 to 10 cm long and ovate to obovate in shape. Paperbark leaves are evergreen, lanceolate, simple and short-stalked, parallel-veined, alternate in arrangement, and aromatic when crushed. 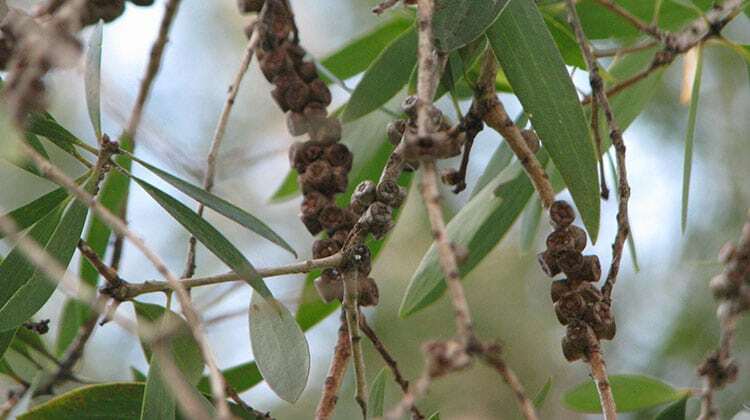 Broad-leaved paperbark fruits are small, round woody capsules containing 200 to 300 seeds. They can be harvested by leaving the ‘gum nuts’ on a window sill for a week or two, at which time the seeds will fall out. 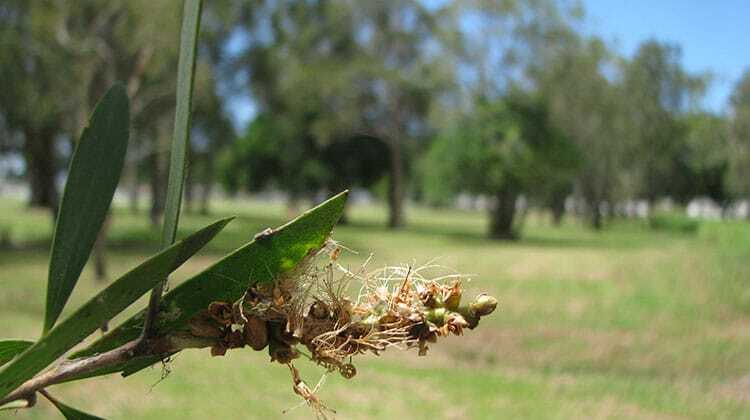 The paperbark usually propagates by sexual seed production. The species matures rapidly, and is capable of flowering within three (and as little as two) years of germination and as frequently as five times each year. 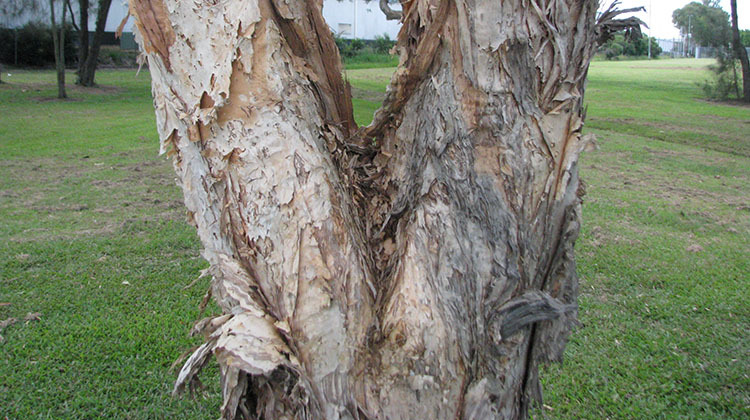 Paperbark grows naturally in silty, swampy soil, such as on the borders of estuaries or swamps. The paperbark tree is cultivated for a variety of purposes, especially by indigenous Australians. A brew made from the leaves was used to treat colds and other sicknesses. The papery bark was used to make coolamons, shelters, and the lining of ground ovens. The timber can be used for outdoor structures such as fencing, because it is tolerant of being water saturated. To avoid being infested by borers they should be well-cared for. Ideally, mulch from near the trunk to the drip-line of the tree. Avoid piling mulch against the trunk to prevent insects accessing the root crown through the mulch. Contact an arborist for an assessment if it is near your house or an area where people frequent. A non-adjoining neighbour has asked us to severely lop our beautiful 16 year-old broadleaved paperbark as he does not appreciate it being in the foreground of his city view (it partially obscures about 20%, horizontally, of his magnificent city panorama). The tree grew 2-3m in the past year to its current height of approx 8-9m, following the storm-loss of a neighbouring tree. Does this variety of tree respond well to lopping? We would appreciate some advice on pros and cons of lopping as it is a highly valued tree from our perspective and that of two immediately adjoining neighbours. Location is Brisbane. Hi Daniel. They can recover well if pruned by a well-trained arborist but pruning by a tree lopper will result in either dead wood or shoots that will fail later. Thank you for your article. Do you know what causes the holes /circular marks in the bark? Hi Kylie. They are the exit holes of borers. Paperbarks are strong and can withstand a considerable infestation of borers, though they have their limits. It’s important to maintain them in good health.